XC 10x42 is rated 5.0 out of 5 by 9. Rated 5 out of 5 by scissors from Another fine Steiner product This is my 3rd pair of Steiner binoculars. Sharp and clear as usual. My other two pair are porro prisms, and this being my first roof prism, I did a lot of comparing with other brands before purchasing, both on-line and side-by-side in the field. Advantages over competitors include better image contrast, nice objective covers, side-shielded eye pieces, and tripod mounting hole. Easy focus stays put. A bit of veiling glare on the bottom at times, but not distracting. Rated 5 out of 5 by Vett guy from XC10x42 are exceptional quality with good optics. Purchased for African Safari in 2/16, based on price, size of objective, clarity of lens, and fast focus. Did a lot of research on the net for comparable binoculars and found that for the price and features nothing compares. Rated 5 out of 5 by Steve11 from Not like my Dad's old Steiner binoculars. I've had the same binoculars for some 40 yrs. I figured I was due for a new pair. These Steiner XC 10x42 were the right purchase. The clarity and definition compared to my old Bushnell's is astonishing. I highly recommend these binoculars!! Rated 5 out of 5 by Sprachinseln from Brilliant optics and superior quality I used Steiner binoculars in the military, and their ruggedness and outstanding optics convinced me to buy them again, although this time with greater magnification. The new ones are easy to use, fairly lightweight, and the best all-rounder binoculars I have had the pleasure of owning. Rated 5 out of 5 by Rick12345 from This product is high quality I have owned these binoculars for about a month an I am very impressed with the quality. I own other brands of optics that are comparable in price but the clarity is the best I have ever used. I would give this product a 10 out of a 1 to 10 rating. Awesome!!! Rated 5 out of 5 by Tony26 from Excellent quality Easy to glass all day. Excellent clarity. Wasn't sure about the eye cups, but I'm sold on the comfort. Couldn't be happier. Rated 5 out of 5 by Dick68 from Great product and a reasonable price. I bought these two years ago but forgot to register them at the time. I guess I was enjoying using them too much! I have looked at a lot of high end US, German and Austrian products some of which cost around $3,000 or more and could not justify the expense for just a little better performance. For my requirements the Steiner XC 10X42 gives top notch performance for a reasonable price. Rated 5 out of 5 by Jay Banks from Great optics I have several Steiner scopes and another pair of Steiner binoculars. That pair is10x56 and I decided that I wanted another smaller pair for hunting in closer situations. I have a couple of stands that my shooting lanes are only 100 yards or so. I didn't hesitate and went back with another Steiner product. Cannot go wrong with them. Do the eyepieces adjust for eyeglass users? If so how do they adjust? Yes, they rotate out to adjust for different eye relief. I am looking for binoculars that I can use for both hunting and nature/wildlife viewing. I like the XC and Predator models, but which would be more diverse? Or would you recommend a different model? The XC would be more versatile as a multipurpose binocular, as the Predator is specialized towards hunting. The Predator's unique Color-Adjusted Transmission coatings gives colors associated with game much more contrast to the typical shades of underbrush and terrain. This color manipulation would affect bright colors that a nature enthusiast or birdwatcher may be interested in. 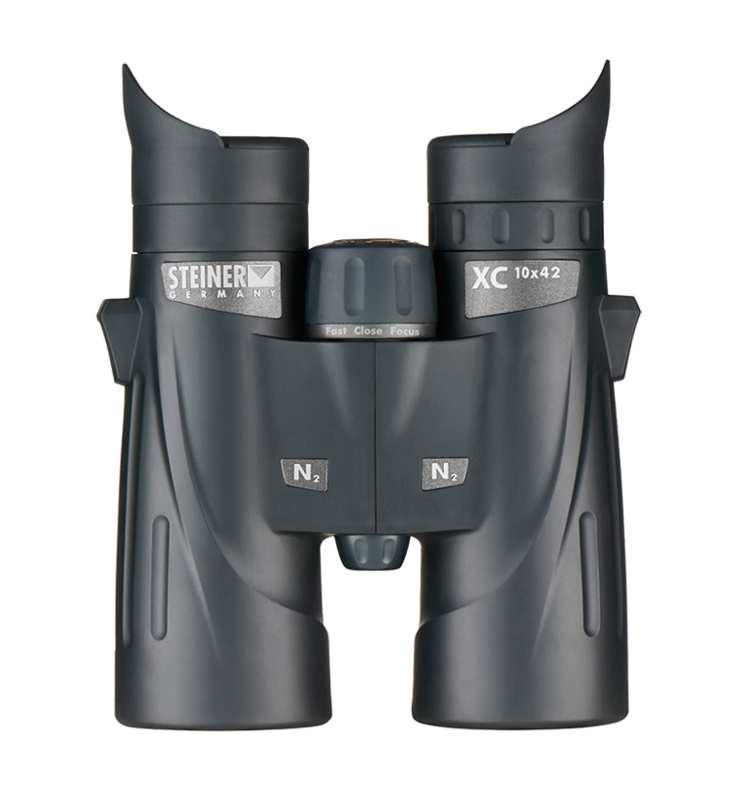 Do the steiner XC 10x42 binoculars have tethered lens caps? XC 10x42 binoculars are equipped with a clickloc system for attaching the included lens covers and strap to the binocular housing. I saw a Steiner Binocular that had correction for astigmatism. Which binoculars have this and how much astigmatism correction? do they have tacticle reticle with crosshairs? i am looking for one that does not have this. The only roof prism binoculars that possess a reticle are the #6508 Tactical 10x42r. *All* other roof-prism models, such as this pair of XC's, have no reticle in them. Does Steiner make binoculars that are self adjusting? We do not. The closest to self adjusting would be the Sport Auto Focus feature available on our porro prism models.